June is National Men’s Health Month, and Curél is here to remind you about the importance of skin health. The skin is your largest organ, and Curél can help you ensure you are treating it properly. Chronic dry skin can be a serious issue, but Curél Skincare Fragrance Free Daily Moisture Therapy Lotion helps to heal and protect dry skin– keeping your skin healthy every month of the year. It's no exaggeration, I have extremely dry skin. I have to keep it continuously moisturized or it will flake and itch. Curel, known for their moisturizing lotions, is a brand I've turned to many times for help with my dry skin. I was recently able to review the Curél Skincare Fragrance Free Daily Moisture Therapy Lotion, and it came at an opportune time. Me and my daughter got matching tattoos not too long ago. Aftercare instructions were to apply fragrance free lotion after taking care of the tats with skin protectant ointment for a period of time. I've been applying Curél Skincare Fragrance Free Daily Moisture Therapy Lotion to the tattoo on my arm a few times daily, and it's helped keep the tat from becoming dry or flaky during the healing process. As for the rest of my skin, it is still quite dry so I have to apply Curél Skincare Fragrance Free Daily Moisture Therapy Lotion three or four times a day to my body. The softness and moisturizing feel of the lotion lasts a few hours, then I have to apply more to my skin. I like the soft, refreshing, silky feel of this lotion. It has a thick, creamy consistency and absorbs quickly. Because it is fragrance free, my husband likes it as well. He uses the lotion from time to time and agrees that his hands feel a lot less rough after application. 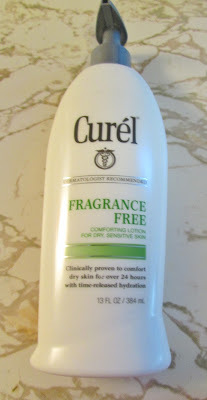 I use Curél Fragrance Free Lotion daily. I cannot have fragrances on my skin so this is good. I use Curel from time to time, but I definitely need to start using it all the time it works better on my skin than other lotions I've been using. Curel has alway been good. We will have to try this one. Thanks!